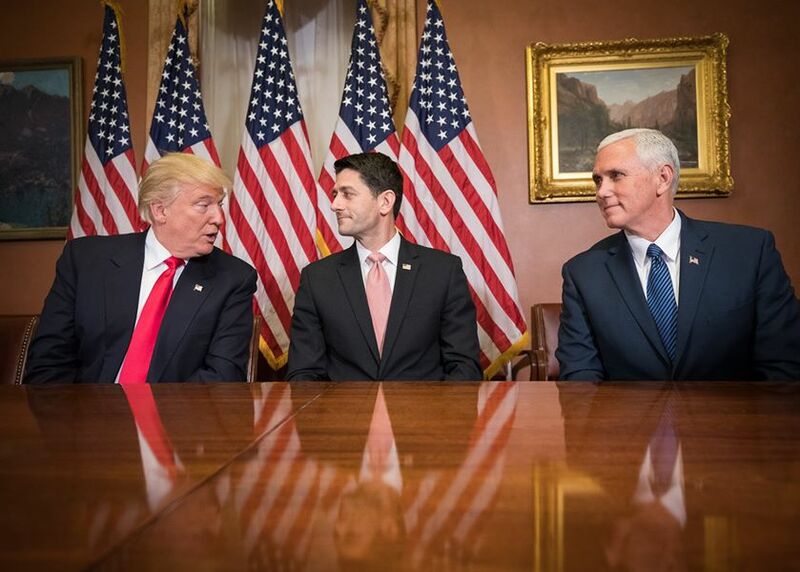 Donald Trump, Paul Ryan and Mike Pence. Photo from the Office of the Speaker of the House. It’s a stance that is hugely popular with American voters. One poll found 74 percent of voters say federal projects should be built with American-made products. But Republicans in Congress, led by House Speaker Paul Ryan, who represents the state that is second-most dependent on manufacturing, recently rejected a golden opportunity to buy American-made goods. It was back in July the Wisconsin’s Democratic U.S. Senator Tammy Baldwin introduced the “Made in America Water Infrastructure Act,” which requires that 100 percent American-made iron and steel is used in water infrastructure projects funded by the Drinking Water State Revolving Fund, created to help ensure safe drinking water all 50 states and territories. In September, this reform was added to the Water Resources Development Act that passed the Senate overwhelmingly, on a 95-3 vote. The House, however, didn’t act on the bill before the election and then when it was taken up in November, Ryan was lobbied by opponents of the Buy American provision. When it comes to the Washington swamp that candidate Trump promised to drain, almost no one employs more of its shadowy denizens than Squire Patton Boggs. Ranked as one of the 30 largest law firms in the world, Squire Patton Boggs is also the third-largest largest lobbying firm in America. It lobbied for more than 100 clients in 2016, earning nearly $14 million, according to OpenSecrets.org. The philosophy leading some to oppose the provision was explained to the Wall Street Journal by Rep. Mark Sanford (R – South Carolina), a member of the Transportation and Infrastructure Committee that crafted the House’s version of the water-resources bill: “Quotas in any form and in any sort ultimately hurt the consumer. They’re a form of protectionism, plain and simple,” he said. But protectionism is exactly what candidate Trump promised. Not long after the lobbyists went to work, “the Buy America language disappeared,” as the Cleveland Plain Dealer’s website reported, and Ryan and Republicans were hit with a storm of protests. Baldwin issued a press release declaring that “American workers should build our infrastructure with American products and taxpayers’ money should not be spent on Chinese or Russian iron and steel. Ryan and Congressional leaders responded by restoring the bill’s older language, with a one-year Buy America provision, and eliminating the Baldwin-authored proposal making the provision a permanent part of the bill. The House version of the bill then went back to the Senate, and Baldwin and Brown called on their colleagues to reinstate the language of the bill they had passed overwhelmingly. But Senate Majority Leader Mitch McConnell declined to do so. In reaction, Baldwin issued a press release calling on Trump to “take a stand in support of American workers” and back the permanent “Buy American” provision. But there has not been a word of response from the new president. It’s certainly possible that a provision with a longer life might be passed at some point in the future. But if it could be killed by lobbyists at the height of the hubbub over Trump’s victory and amid his tour touting the critical need for a Buy America policy, what chance will it have as all the fervor fades? The provision won’t pass unless Trump teams up with Democrats and rogue Republicans and attempts an end run around GOP leaders like Ryan. The left should prepare a short TV ad containing clips of Trump’s “Buy American” promises, a description of what Paul Ryan is doing, followed by a tagline of “Call President-Elect Trump and tell him keep his promises to America’s workers”. This ad should be run in the blue-collar industrial areas Trump carried last month. This is a necessary but not sufficient answer to the WHY question. Walker agrees with the likes of Paul Krugman on this issue. Trade is good for all kinds of reasons, not just cheap socks at Walmart. Less wars go along with more trade. Or it is simply irrelevant as a host of economists point out that automation not trade takes good jobs out of the hands of American workers. Walker could also be a good Christian and ask what would Jesus do? One old-fashioned American job that got a family and their kids a college education gives 12 families in China indoor plumbing for the first time in their lives and iphones! The Political equations: Trump and some GOP candidates made promises to appeal to voters (as pols do). Now those voters’ concerns will be pushed aside as lobbyists, and all the campaign cash they can help deliver, will be the only voices that really matter. It’s a sordid bait and switch, not limited to one party. But it looks like it may be in full flower with Trump, whose team will be full of olligarchs and plutocrats (with a few hard-core bigots and fascists for good measure). Ryan and Priebus seem likely to fall in line like altar boys and good soldiers. Ryan will try to feign concern about voters. Priebus will try to mask his blind, soul-less ambition with his nasal-y Wisconsin twang and attempts at folksy charm. It’s already wearing thin. The world has changed dramatically in the past 70 years, or so. America had led the way in showing the rest of the world how to manufacture..and they took our “advice,” and now lead in many ways, be it in manufacturing..and even in sports. Baseball, basketball, golf, tennis, etc., are now dominated by foreigners…after we showed them how. Their gain, our loss! Obviously, we’re spoiled with the prices of “foreign” merchandise and most likely will be unprepared for increases…even if they’re American made. The last time I checked merchandise in many local stores, I noticed that almost ALL of the products were imported…and priced “affordably.” I wish Mr. Trump the best with his PROMISE to “Make America Great Again,” by bringing jobs and products back again, but methinks it’s a long shot at best. We’ll wait and see. Ryan also voted for auto bailout. Now and again he ditches principle for party reasons. Power corrupts. I worry what this speakership is doing to him. And when JOker removes his makeup and folks see he is really Bruce Wayne, will they shout “Lock him up!” Merry Christmas, Bruce! Trade is good, however Americans can’t compete when we allow American companies to have products made overseas and still sell them in the USA. Production cost in the USA is higher for many reasons. Minimum wage, payroll taxes, L & I, Vacation pay, sick leave and health insurance just to name a few. We the people decided we wanted these protections for a better society. When we allow American companies to move production overseas and still sell those products here they have made an end run around our rules and laws. So which do we end, the rules and regulations to protect workers or cheap imported goods? We can’t have both forever as we can now clearly see the results. U.S. voters have been far too forgiving of self-serving hypocrites in recent years. The communitarian spirit engendered by F.D.R. and enhanced by the labor movement made life better for a majority of Americans for 60 years or more. Self-serving hypocrites in high public offices have all but killed that communitarian spirit. Democrats need to remind voters of the common good afforded by F.D.R. Truman, Kennedy, Johnson, Carter, Clinton and Obama. Automate, and obliterate foreign imports and producers.